Do you share a computer with other users and want some extra security on your folders? There are two ways to password protect a folder built into Windows XP (for other Windows flavors, there are some freeware/shareware programs out there). Right-click the folder that you want to make private and choose "Properties" (or Alt+Double-click). Go to the "Sharing" tab and check the "Make this folder private" box. Click Apply . If you do not have a password on your account, a box will pop up asking if you want to assign a password. This must be done if you want to make the folder private, so click Yes . You will need to use your password to log on to your computer from then on. Type in a password then confirm it. Click the "Create Password" button then close the Password window. Now anyone else logged on to your computer can't access that file without knowing your password. 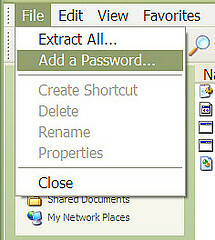 #2 If the Folder is Zipped you can give it a unique password. Just double-click the zipped folder. In the top menu select File then click "Add a Password". Type a password into the Password box. Then again in the "Confirm Password" box. Now, you are the only person who can access files in this folder. The folder can be opened allowing the files to be seen, but you are the only one who can access them. Don't you feel more secure now?